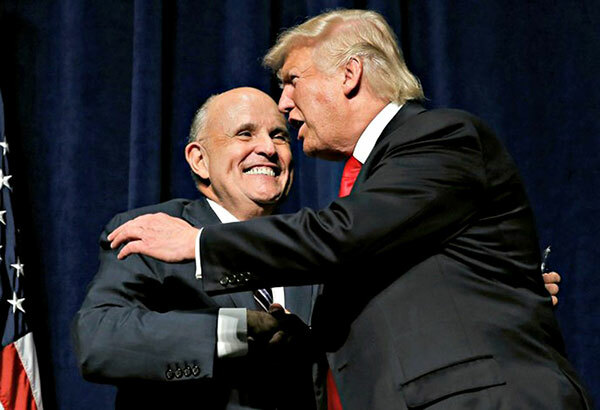 The Immelman Turn » Blog Archive » What Role for Rudy Giuliani in Trump Administration, If Not Secretary of State? Former New York mayor Rudy Giuliani, a contender for the Republican nomination in the 2008 U.S. presidential election, has been floated as a prospect for nomination as U.S. Secretary of State in the Trump administration — and Giuliani has expressed strong interest in this key cabinet post. 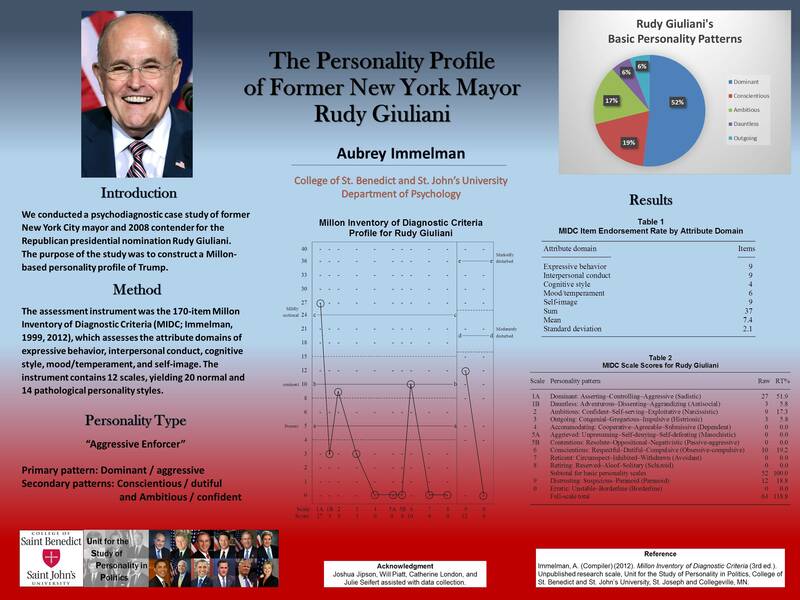 Studies of Giuliani were conducted at the Unit for the Study of Personality in Politics in 1999-2000 when he briefly run against Hillary Clinton for U.S. Senate and in 2007-2008 when he ran for the GOP presidential nomination in the 2008 Republican primary. 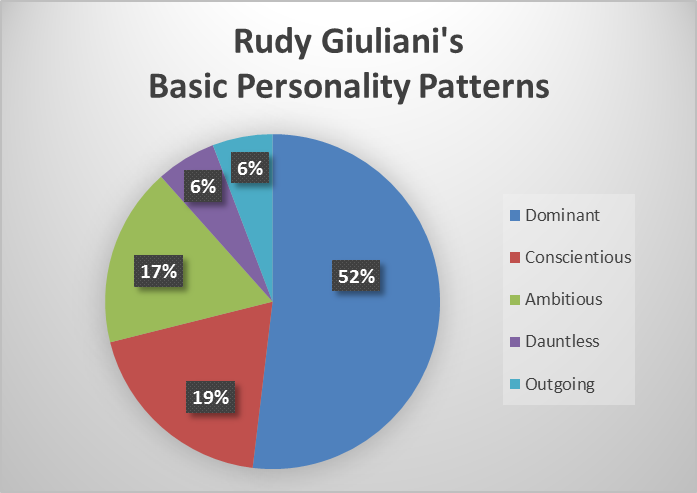 Empirical analysis of the data revealed that Giuliani’s primary personality pattern was Dominant/aggressive, with secondary features of the Conscientious/dutiful and Ambitious/confident patterns. The combination of highly dominant and conscientious patterns in Giuliani’s profile suggests an aggressive enforcer personality composite. Leaders with that particular personality profile are characteristically tough and uncompromising, with a forceful style that permits them to take charge in times of crisis; however, they are not known for being very diplomatic — even in these turbulent times presumably still an asset with some currency in the arena of foreign affairs. Giuliani’s major personality strength in a high-level leadership role is a forceful, commanding personality style that permits him to take charge in times of crisis and inspire public confidence. His major personality-based limitation is a controlling, occasionally punitive, tendency to control (which may foster divisiveness and animosity). Based on his psychological profile, Mayor Giuliani would be a riskier choice for Secretary of State than Gov. Mitt Romney, despite the fact that Giuliani is close to Donald Trump and played a pivotal role as a key surrogate in the president-elect’s successful election campaign. Considering his personality profile and leadership experience in the wake of the 9/11 terrorist attack and its aftermath, Rudy Giuliani would be better suited as Director of National Intelligence or Secretary of Homeland Security. 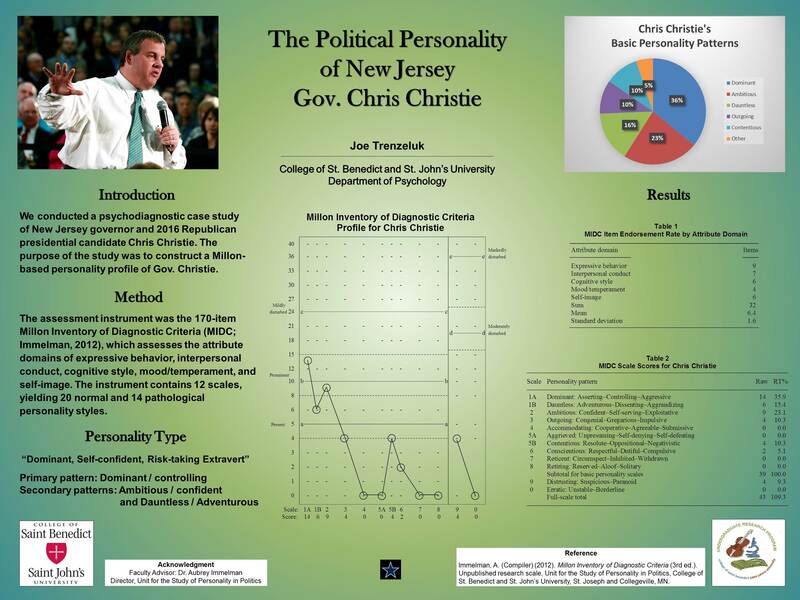 It is unclear what if any role New Jersey Gov. Chris Christie, who is being interviewed by the Trump transition team at Donald Trump’s Bedminster golf club in New Jersey today for a possible appointment, might play in the Trump administration — especially in view of the ongoing fallout from the Bridgegate scandal. President-elect Donald Trump will meet meet Monday with former Texas Gov. Rick Perry, who is reportedly under consideration for Secretary of Energy or Secretary of Defense in the Trump Cabinet. A psychological analysis of former Massachusetts governor Mitt Romney — Republican nominee in the 2012 presidential election — conducted in fall 2007 by Julie Seifert, Mick Lundstrum, and Aubrey Immelman, Ph.D., at the Unit for the Study of Personality in Politics revealed that Romney’s primary personality pattern is Conscientious-dutiful, with secondary features of the Dominant-asserting and Ambitious-confident patterns. 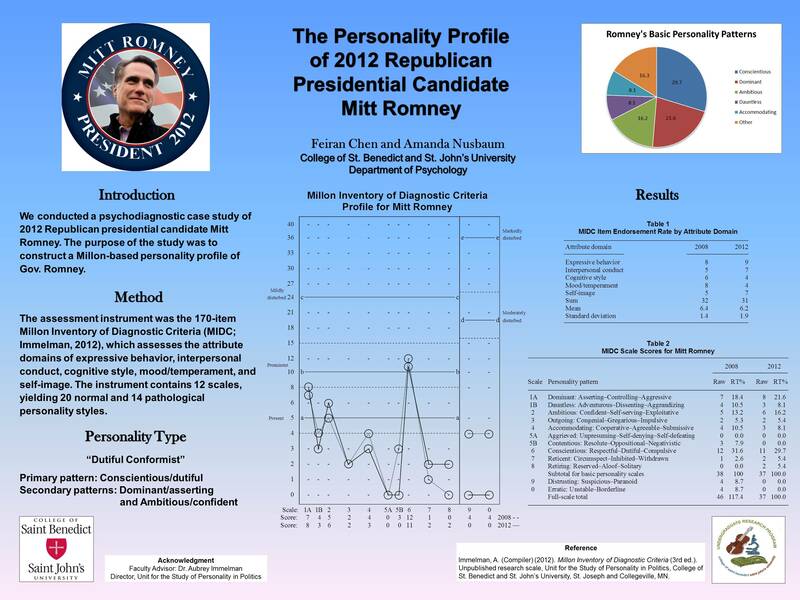 In summary, Romney’s personality composite can be characterized as a dutiful conformist. 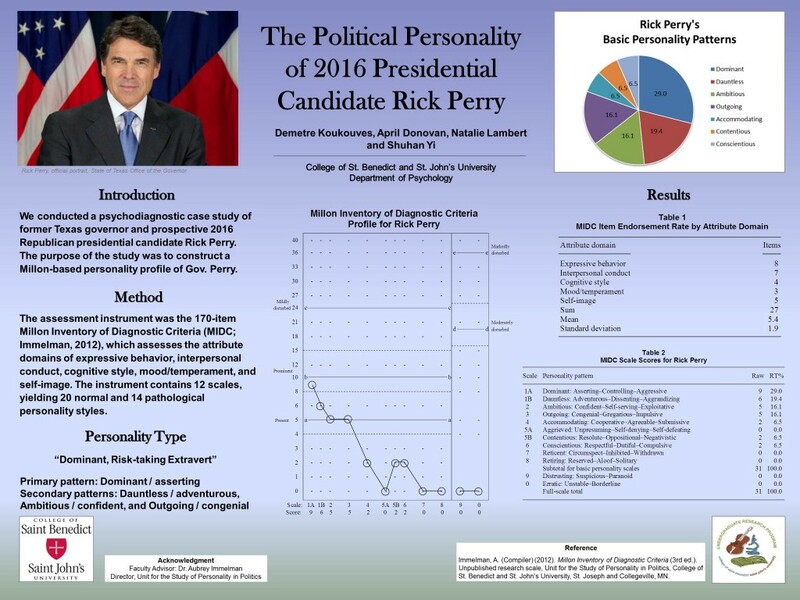 A psychological analysis of former Texas governor Rick Perry — a contender for the Republican nomination in the 2016 presidential election — by Demetre Koukouves, April Donovan, Natalie Lambert, Shuhan Yi, and Aubrey Immelman, Ph.D., at the Unit for the Study of Personality in Politics, revealed that Perry’s primary personality pattern is Dominant/asserting, complemented by secondary Dauntless/adventurous, Ambitious/confident, and Outgoing/congenial features. In summary, Perry’s personality composite can be characterized as a dominant, risk-taking extravert. « Mitt Romney for Secretary of State?